I don't know if I would be happy to fly so close of an active volcano that is ejecting lava like in this photo featured on National Geographic's Your Shot. 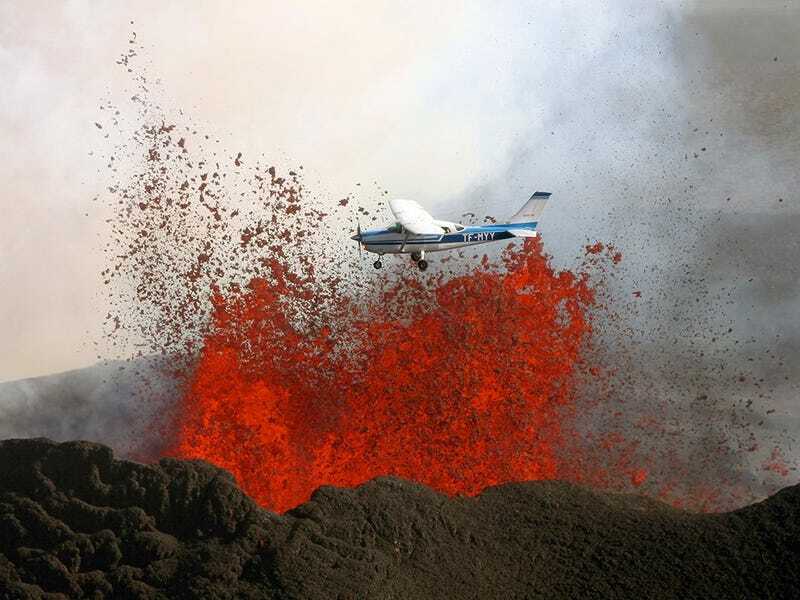 I know the plane is not flying over the lava, but you never know when Earth is going to get mad. For photographer Baldur Sveinsson, however, it's business as usual. Every Icelander has watched this from the day that the earthquakes under the Bárðarbunga volcano on the Vatnajökull glacier started. A pilot friend of mine wanted to have a look at the eruption, which is about an hour from Reykjavík. We weren't able to find any other aircraft to accompany us but decided to go anyway, as there are almost always some in the vicinity for sightseeing. We found one doing its passes from north to south. It's at least 300 meters [984 feet] in front of the lava spout. 300 meters! That seems like a lot, but still way too close to something that can unexpectedly explode without warning.